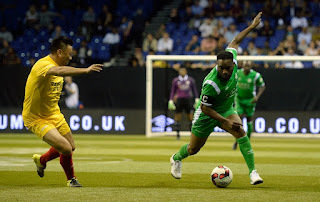 Nigeria on Saturday night were thrashed 8-1 by Spain and subsequently eliminated from the maiden edition of the six-a-side Star Sixes Football Tournament in London, reports Completesportsnigeria com. Early goals just after the whistle from Lucho Garcia and Mitchel Salgado unsettled the Nigerian side. Alfonso Perez Munoz virtually eliminated the Super Eagles heroes of yesteryear with the third goal of the first quarterfinals match barely eight minutes into the clash. Salgado scored two more goals for the Spanish team to take his tally in the tournament to five in four matches. Former Super Eagles keeper Peter Rufai went off injured with a knock and was replaced by former Northern Ireland keeper Maik Taylor since every team had just one goalkeeper.